The Model 612-TX Triaxial Piezoelectric Accelerometer is designed to meet the most stringent space and mass loading requirements with a weight of only 8 grams and a volume of 0.082 cubic inches. 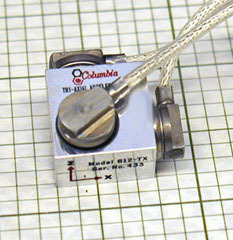 The 612-TX incorporates miniature shear-type accelerometer inserts bonded into a machined aluminum block. The electrical isolation provided by the epoxy bonding permits accurate, repeatable measurements even in noisy industrial environments. This unit is equipped with the exclusive Columbia microminiature detachable cable assembly that is easily replaced. The Model 612-TXHT is a high temperature version that will operate in environments up to +500 Deg. F.